5th lunar month of 1844: born in Edo in Asakusa, in either Saruwaka-chô or Suwa-chô. 1862: he started his career as a disciple of Segawa Jokô III. His first pen name was Hama Hikosuke. 1870: Hikosuke and his father Katsu Genzô II settled in Ôsaka. 3rd lunar month of 1872: the drama "Zôho Chûshingura"  was staged for the first time in Ôsaka in kodomo shibai at the Inari Shibai. 1874: he took the name of Katsu Hikosuke and went on tour in Matsusaka with a troupe led by Nakamura Sôjûrô. 1875: he stopped working as a sakusha for one year. With his first wife Osen, he rented a room in a chaya named Otafukuya in the district of Nanba and they used it as a kamiyui shop. September 1876: Hikosuke was back in the Kabuki world; he worked with his father Katsu Genzô II at the Ebisuza on the drama "Gokoku Onna Taiheiki", which starred Jitsukawa Enjaku I, Nakamura Jakuemon II, Nakamura Fukusuke III, Nakamura Kashichi IV, Jitsukawa Enzaburô III, Jitsukawa Shôchô, Nakamura Hikaku and Asao Yoroku III. 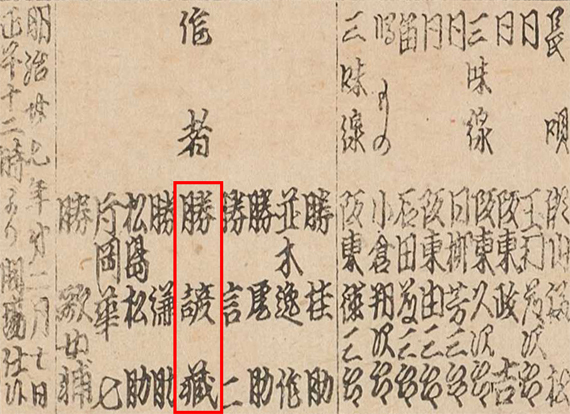 April 1878: Katsu Genzô II and his son Katsu Hikosuke respectiveley took the names of Katsu Nôshin and Katsu Genzô III. They worked together at the Naka no Shibai on the dramas "Kinsei Sakurada Yuki no Kikigaki", "Miyakodori Nagare no Shiranami" and "Santo Meisho Utsusu Irodori". 28 June 1881: his master Segawa Jokô III died. March 1882: premiere at the Kado no Shibai of Genzô's drama "Seichû Gishi Genroku Kabuki", a revised and reworked version of three acts which were added by Segawa Jokô III to the classic "Kanadehon Chûshingura" in the in the 5th lunar month of 1856 at the Moritaza. Genzô made it as an independent play. As he was no more subjected to censorship, Genzô was able to use the real names of the protagonists and, in this new version, Lord Matsukura became Lord Matsuura. This role was played by Nakamura Tokizô I. 1884: Katsu Nôshin and his son Katsu Genzô III respectiveley took the names of Kawatake Nôshin II and Takeshiba Genzô II. May 1885: Genzô, along with his father Kawatake Nôshin II and the sakusha Namiki Shôzô III, worked at the Ebisuza on the first Kabuki adaptation of a William Shakespeare's drama; "The Merchant of Venice" was adapted under the title of "Sakuradoki Zeni no Yo no Naka". It has been said that this adaptation is based on Charles and Mary Lamb's "Tales from Shakespeare". This original drama starred Nakamura Sôjûrô, Nakamura Tsurusuke V, Bandô Jusaburô II, Arashi Kitsusaburô IV, Jitsukawa Enzaburô III, Arashi Rishô II, Arashi Minshi V, Jitsukawa Wakamatsu, Ôtani Tomoji, Nakamura Kohakurô, Nakamura Shikin, Ichikawa Ichiroku and Bandô Azuma. 26 October 1886: his father Kawatake Nôshin II died . April 1887: premiere at the Nakaza of Genzô's drama "Nikaigasa Yagyû Jikki" [casting]. Spring 1893: he settled in Tôkyô, took back the name of Katsu Genzô III and became tatesakusha at the Harukiza. During his stay in Tôkyô, he did some lobbying to take the name of Tsuruya Nanboku VI but he failed. He also divorced his second wife Osei . February 1894: Genzô worked at the Kadoza on the dramas "Wake no Kiyomaro", "Go Taiheiki Shiraishi Banashi" and "Yamatogana Ariwara Keizu". 27 October 1902: Genzô died in Ôsaka. Katsu Genzô III was born and trained in Edo but, following his father, he became a leading Meiji sakusha in Ôsaka. He worked along with his father on 300 original Kabuki or Shinpa dramas but only "Nikaigasa Yagyû Jikki" is still in the Kabuki repertoire. At the end of his career, he considered himself as not being a member of the Kawatake clan and severed his relationship with this important family of sakusha. In Nojima Jusaburô's book "Kabuki Jinmei Jiten", it was reported that he had around 40 disciples all over his career. According to Nojima Jusaburô's "Kabuki Jôruri Gedai Yomikata Jiten", the author was Hama Hikosuke. His first wife Osen fell ill and died the same year. She was the younger sister of the wife of the rakugo storyteller Ryûtei Enshi I.